Definition: A Chemical reaction between a metal and its environment to form metal compound. A Chemical or Electrochemical process through which a metal is attacked by natural agents such as air and water resulting in partial or complete dissolution, deterioration or weakening of any solid substance. A common Example of corrosion is “Rusting of Iron” Iron combines with Oxygen in air and water to form Hydrated Oxide of Iron. Situations where the corrosion products do not completely cover the substrate metal. Most of the metals except Gold and few other Noble Metals will form Oxide layers when they react with Oxygen in Air. Metal reacts with Oxygen from Air. Parabolic Gain: The Oxide layer is very stable, the metal ions takes very long to diffuse through the thick oxide surface layer. Linear Gain: The Oxide layer is not very stable, they tend to crack or separate partially from the surface. Linear Loss: Here the Oxide layer Evaporates as soon as it formed due to the high temperatures. This leads to Weight Loss. This type of Corrosion occurs in the Oral Environment. The presence of moisture, temperature fluctuations and the changing pH caused by diet and decomposition of foodstuffs contributes to this type of corrosion. Aqueous Corrosion requires presence of Water or other fluid electrolytes so it termed as wet corrosion. this occurs by Electrochemical reactions as a pathway to the transport of electrons is required. Galvanism is the production of Electrical current that the patient can feel, which is produced when 2 dissimilar metals are in direct physical contact. 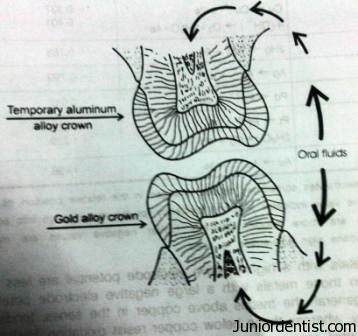 Aluminum alloys used in Temporary crowns have a Electrode potential of +1.66 volts and Gold – 1.49 volts. In presence of Saliva or Oral fluids function as Electrolytes and act similar to that of an Electrical cell. This produces Galvanic Pain and metallic taste. Most patients feel pain between 20 to 50 Uamp. In presence of Adjacent Dissimilar restorations, with Galvanic Action material goes into solution and roughness and pitting occurs. A Single Metallic Restoration canalso show Corrosion, between an External surface exposed to Sailva and internal surface exposed to Dentinal Fluid. When an external metal like, tin foil, silver fork,, Spoon or any other metal comes in contact with the metal restoration. Stress Corrosion: Degradaion by the combined effect of mechanical Stress and Corrosive Environment, usually in the form of crackcing. In orthopedic surgery, stainless steel plates and screws are frequently embedded in tissues. Any differences in the extent of cold working between screws and plate must be avoided. Similarly, different portions of the same piece of steel may be stressed to different extends, thus results in corrosion. Concentrataion Cell Corrosion (or) Cervice Corrosion: An Elecrtochemical corrosion cell, in which the potential difference is associated with the difference in the concentration of the solutions causing corrosion at different parts of the metal surface. 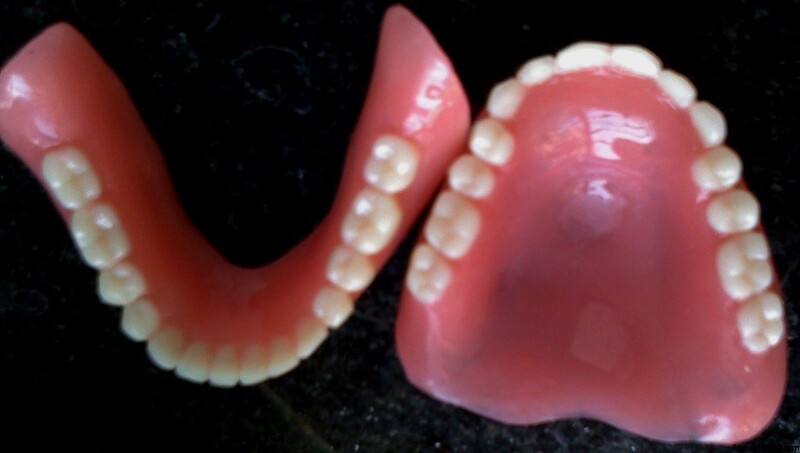 Accumulation of food debris over a metallic restoration or interproximal areas. One type of Electrolyte is formed under food debris and one type in Saliva which causes the Electrochemical corrosion under the layer of food debris. Where there is difference in the oxygen concentration in an electrolyte, an oxidation-type concentration cell is produced. Corrosion is greater at portions where oxygen concentration is lower. This type of corrosion occurs in an unpolished metallic restorations like pits in the restoration.There is less oxygen content at the bottom of the pit which acts as an Anode, Pitting occurs at the bottom of the Pit. This is called Pitting Corrosion. To avoid this type of corrosion the metallic corrosion should be well polished. THANK YOU VERY MUCH SIR!!!!!! !